This tasty number was the recipe of the week for our CSA members. The farm is overflowing with summer squash, tomatoes, eggplants and peppers and we’re loving how bountiful the harvest has been. Our CSA delivery is on Tuesdays so every Monday evening I cook Taylor and myself a dinner that includes the bulk of the vegetables that will be in our members share that week. It’s been really fun to only cook with the items that we’ll include in their boxes (even though we have access to a ton of other herbs/veggies in the field). We really want to experience the same challenge (we also hope joy!) that they do cooking with our produce. I know I’ve mentioned this before but I’ll mention it again- our CSA members are the heart and soul of our farm. If it weren’t for these amazing folks we could not make a living doing what we love. Joining a CSA can be a total gamble- you don’t have control of what will be in your box every week. Since folks end up with quite a few items that wouldn’t normally be on their grocery store shopping list, I try my best to cook/highlight new vegetables so people aren’t at a total loss figuring out how to prepare them. We want our CSA folks (all 45 families!) to find pleasure sitting around their dinner tables eating a meal prepared with our produce. Whisk all the ingredients for the dressing together until smooth and creamy. This works best with an immersion blender or small food processor. Taste test and adjust seasonings if need be. Add a little more water if the sauce is too thick. Preheat the oven to 425F. In a large bowl, toss the eggplant, summer squash and tomatoes with the oil. Season with a little salt and pepper. Place on a parchment lined baking sheet and roast in the oven until the vegetables are browned and the cherries are blistered and bursting. About 25 minutes (times will vary depending on your oven). Toss the veggies halfway through cooking. 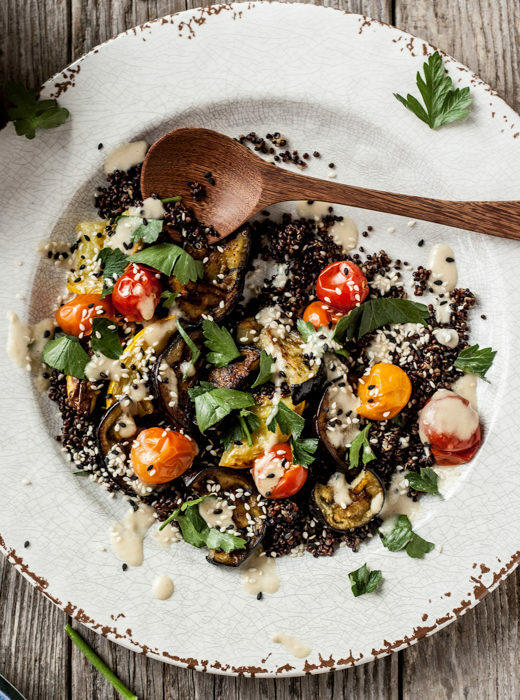 Divide the cooked quinoa between plates and top with the roasted veggies. Sprinkle each plate with toasted sesame seeds and minced parsley. Drizzle with dressing and serve. Hi I love how you manage to make the vegetables the star of the dish! I was wondering if you were able to do a post on your most popular recipes/ your favourite ones I haven’t got time to try out all of your lovely recipes since I don’t always live at home and would love to know what to make what one’s are so delicious. Even though we’re pretty spoiled with abundant local veggies here in Switzerland, I still so wish I could be part of your CSA. And I love this dish. It may just be in my line-up for next week! You’ve inspired me to look into a CSA in my area, and BEHOLD! I found one! In fact, I think I’ll sign up for the fall season drop offs. Can’t wait! I just made this and it is delicious!!!! Made this last night and it was fab! The dressing and sesame seeds rounded it out nicely.